See Holy Week schedule at right for changes. *9 a.m. Mass usually includes signing for the deaf, nursery, and children’s Liturgy of the Word. Coffee and donuts usually in café afterward. Wednesday: 6 p.m., followed by Adoration until 9 p.m.
Holy Saturday, April 20: Easter Vigil Mass at 8:30 p.m.
Easter Monday, April 22: Mass at 8:30 a.m.
See complete Holy Week schedule. Monday-Friday: 7 a.m., 8 a.m.
No Reconciliation on Holy Saturday. Or call the parish office for an appointment at 317-257-4297. To have a Mass offered for someone, living or deceased, please stop by the parish office or call 317-257-4297. Mass offering is $10. Welcome! 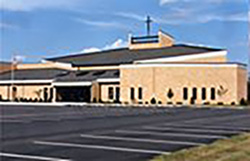 Click here to learn about joining Saint Matthew Parish. Or stop by our Welcome Table in the narthex for information about Saint Matthew Church and School.